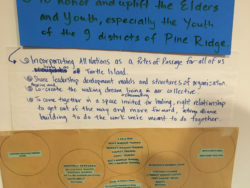 This fall, in the Yellow Bear Canyon just outside of the Black Hills, Youth Passageways brought together a small intergenerational delegation, for relationship building, truth-telling and healing, and explored an alliance to support and uplift indigenous youth throughout the Pine Ridge Indian Reservation. This gathering was one of the many threads that have and continue to build the tapestry of Youth Passageways over the last few years and feels like a foundational step towards actualizing YPW’s mission. 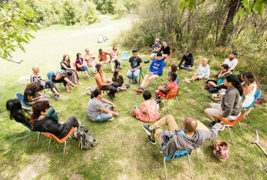 The theme of the 2018 gathering was Spirit Led. What this meant for the group was to allow the unseen to be welcomed and incorporated into our time together and to guide the journey throughout. 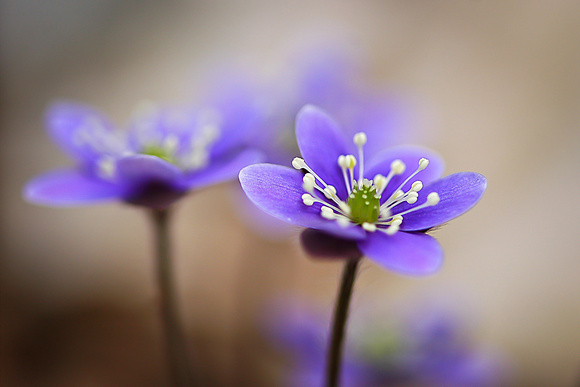 Those gathered let go of attachment to specific ideas of schedule or form that could block the Blessings from coming through. Below are the intentions set as well as other images from some of the breakout sessions and activities from various parts of the weekend. The Days Before – Hard Work and Healing: After more than a year of planning, Marisa and Dane got into a car headed for South Dakota, arriving in Pine Ridge the Saturday before the gathering. Becky met them with her legendary hospitality and joy, and after a great many hugs (and selfies) the work of getting the space ready was well underway. Early on, the organizing team invited participants to offer their labor along with their participation in the gathering. The YPW gathering happened just weeks before All Nations was to hold one of its annual gathering of over 300 folks. Part of their preparations for that gathering was a total overhaul of the kitchen space from pipes to ceiling and the YPW gathering fell right in the time that the bulk of it was underway. As more of the organizing team and other participants arrived over the next few days, it was all hands on deck alongside Yolanda and the All Nations work crew to put the kitchen together and prepare the land for both gatherings. It was a close call but the work was finished right on schedule with the cuts, stains, and smiles to prove it right in time to celebrate Dallas’s birthday! Meanwhile, the organizing team was still looking to find another cook to use the beautiful new kitchen. Becky mentioned they were considering hiring someone for their larger gathering and that he would be available to help with the Youth Passageways meals. After driving into Porcupine, Dane met Filmore Richards, a two-spirited man, in his early 50’s with a laugh for days. Alongside Aidoneus Bishop, a Sámi man who generously volunteered his time to create the menu and lead in the cooking, the kitchen was finally complete. The finishing touch was making sure the most important part made it back in the newly upgraded kitchen which Marisa lovingly hung next to the brand new industrial grill– the sign for Becky’s Kitchen! In keeping with her invitation of healing, Becky had arranged for one of their medicine man, Leksi’ Johnny Gibbons to hold a Yuwipi healing ceremony for the members of Youth Passageways that had arrived and for their larger community on the Reservation. It was an incredibly powerful evening for all those who took part, directly in the ceremony or in their own ceremonies alongside. Folks shared and prayed and were opened up long into the early hours of the morning, before heading to their beds in anticipation of the official ‘start’ the next day. 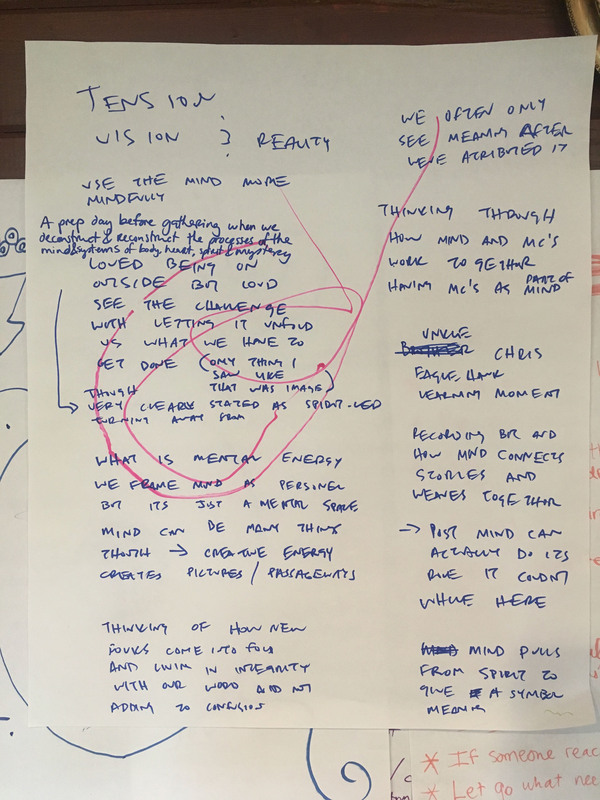 Day One – A Map, Emerging: Folks that had been in ceremony the day before found themselves still very much in that space upon waking. Others arrived at different times, and were welcomed to the land and began to weave into the flow of our time. Collectively, those present began to develop a “Map of Wholeness” (a term shared with us by Gigi Coyle). 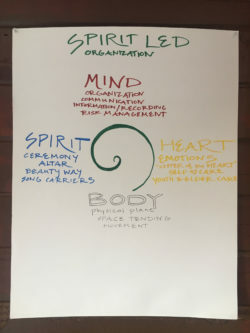 Grounded in how All Nations holds the components of Mind, Heart, Body, and Spirit, in their work, this map provided the outline for how we would share responsibility for our time together. 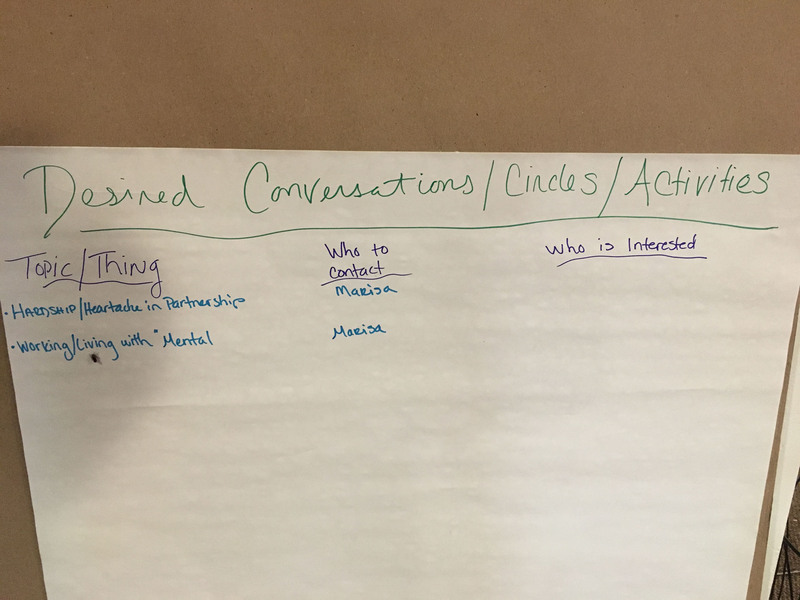 The map continued to develop over the weekend and continues to evolve as it becomes a core organizing framework for our operations as a network. That morning, we sat together in a round of introductions: who we were, where we come from, why we were here. 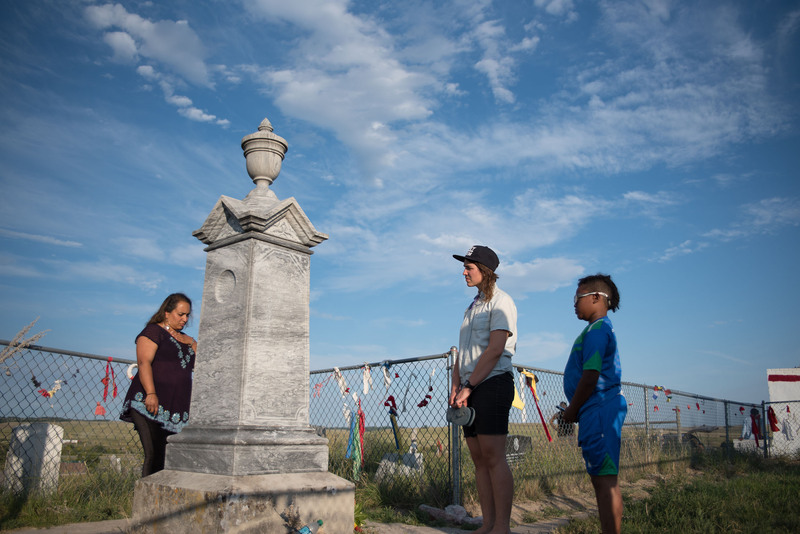 Becky’s mother and father joined the group to share about their lives at Pine Ridge and beyond, which reinforced a desire by many of the folks who had arrived to see more of the surrounding reservation. 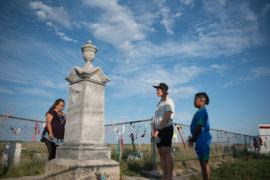 That afternoon, Becky took a group to Wounded Knee and the Badlands National Park to see some of the history of the place, and to bring it fully into the opening. That evening, after everyone ate the first of many wonderful meals prepared by Aidon and Filmore, the participants came together in prayers and blessings to officially open the gathering. The Youth Passageways delegates brought gifts from their ancestral lineage or the lands they lived. 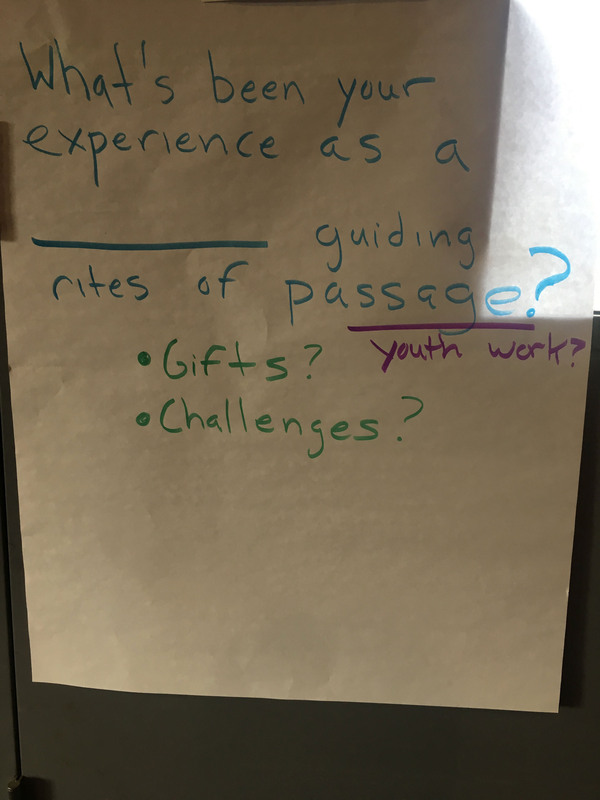 One by one, each delegate was invited to come to the center and speak to what their gift was and to offer it to the center table or to a specific person from Pine Ridge. There were so many gifts offered that they filled the table and the floor around it! 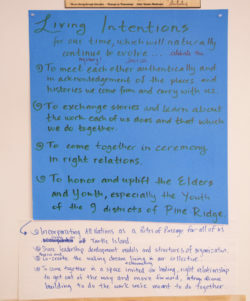 The Pine Ridge residents were then invited to choose the gift they wanted and the rest were placed next to the altar for those who would arrive throughout the gathering. 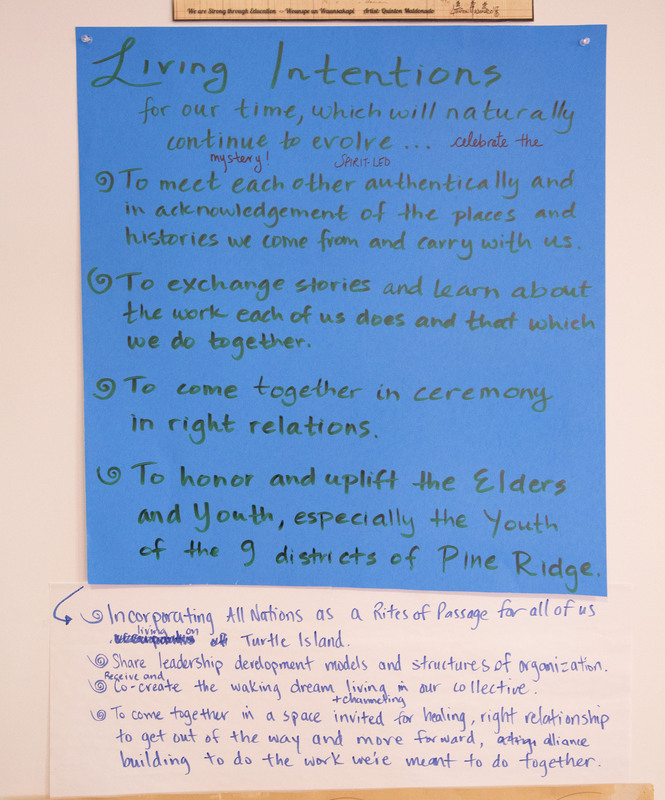 The invitation to gather on the ancestral lands of the Lakota people was met with gratitude; it was a special moment for many of the delegates that had been holding the story of YPW all the way back to its origins in Hawai’i or even beyond. The evening ended with a round of introductions and acknowledgments, a rich sense of exchange clear and present in the air. Day Two – Mind, Body, Heart: The second day started with the Facilitation Team, Clement Wilson and Ramon Parish, alongside Becky and Dallas, inviting the larger body to break up into self-identified caucus groups of Olders/Yelders/Elders, Queer, Youth, Settler, Indigenous, and “?”. 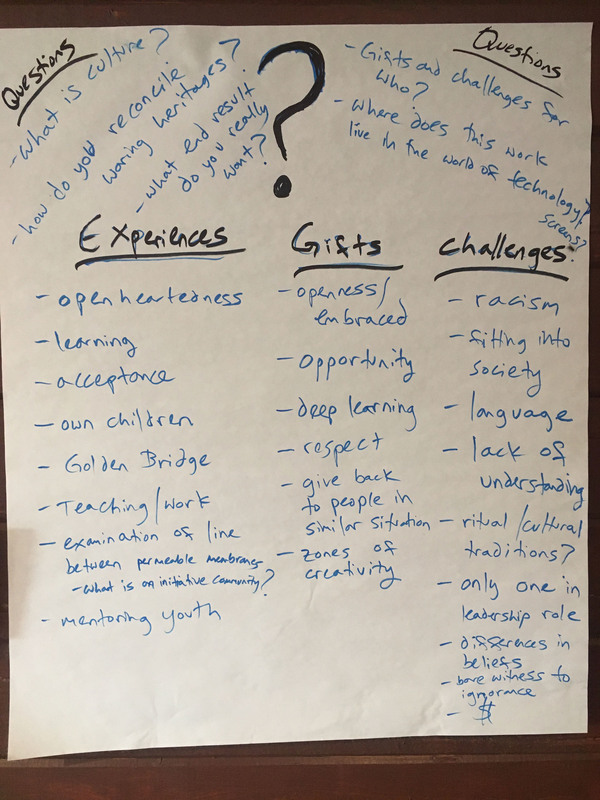 Each was then asked to reflect and share on the challenges and gifts they saw as part of the group they were in, see photos for what came out (including the modern art provided by the Olders/Yelders/Elders). This was also a time for folks to get some time to be in smaller conversations. 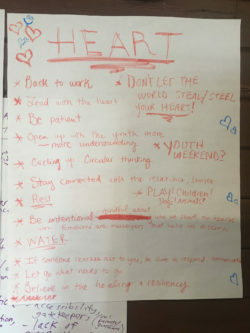 After lunch, the YouthVoice group held by Marisa, Lia, Kruti, and Delacina invited participants out for a no-holds-barred game of Capture the Flag (led by 2 youth captains Michael and Khalil) and oh what a game it was! Arguably, one of the biggest takeaways from the gathering is confirmation that Orland Bishop will indeed divebomb the ground in order to advance a game for his team! Afterward, there was a debrief and then some needed time to decompress. Later that evening after dinner, everyone met back in the central meeting space where Brother Larry Swallow, one of the ceremony and story holders of the All Nations community, gave a lively and interactive telling of the Lakota Creation story and the Seven Sacred Medicines gifted to the Lakota people by White Buffalo Calf Woman. The sharing of the traditions of the Lakota people opened conversation around the challenges and opportunities of the interfacing of these long-standing traditions with multi-cultural worldviews. One example that surfaced was how two-spirited and non-binary folks can feel seen and welcomed for who they are, across cultural differences. 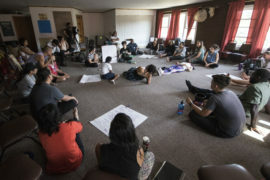 As the evening closed, folks went to various spaces, with fireside conversations that emerged from the day weaving into the Dreamtime of the night and the gathering overall. 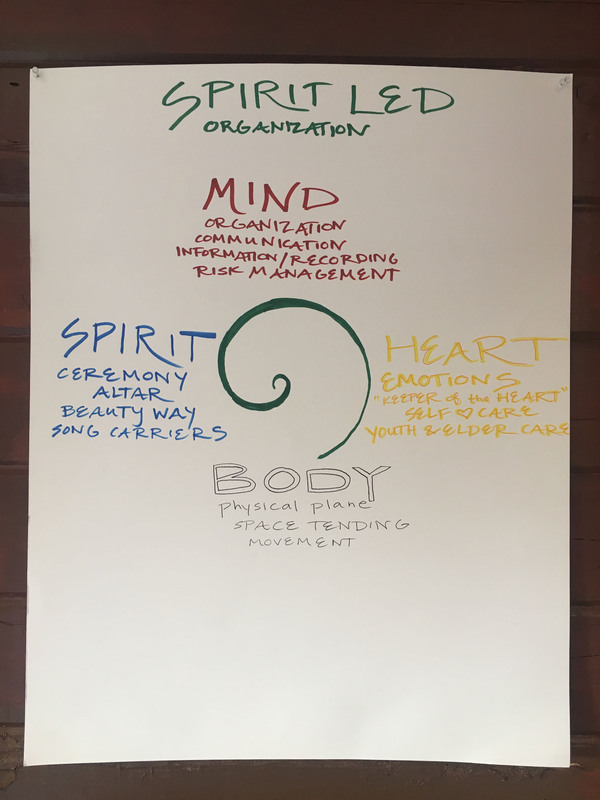 Day Three – Spirit Led: By the third day, the participants were living in the flow of “Spirit Led,” of letting go of agendas and accepting that what needed to happen will. That morning, Becky and Dallas invited community elders Leksi’ Chris Eagle Hawk and Leksi’ Cecil Cross to join the group and for a water blessing that would happen at some point during the day. Leksi’ Chris shared his story of being taken from his home and forced into a Catholic Boarding School and how that directly impacted the way he was unavailable for his children for most of their childhood, as well as the steps he took to come back to himself, his culture, and the lifesaving power of its medicine. Afterwards, the group convened to bless a freshwater spring on the property with the hopes for it to become an artesian well sometime in the next year. The time in nature continued as Leksi’ Cecil and Dallas took a group up into the bluffs that line the Yellow Bear Canyon in which All Nations is perched. 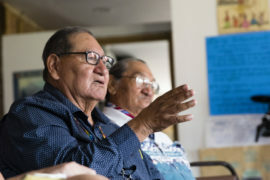 They spoke of the land, the medicines there, and the experiences they have had with young ones learning their traditional ways through All Nations. Through this the hike, the expansiveness of the land and of All Nations larger relationship to it, became infinitely clearer to the participants who walked the bluffs. 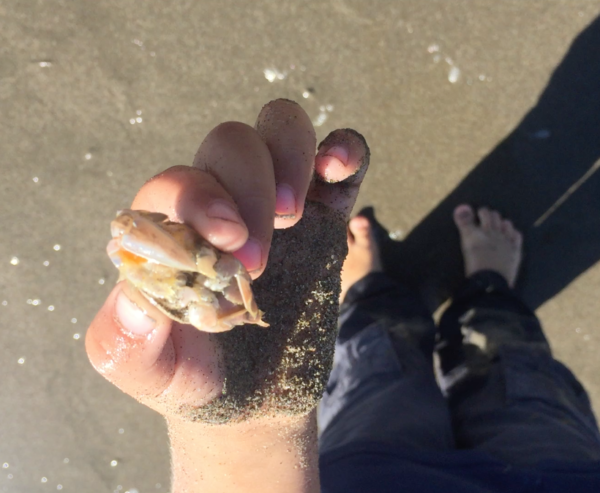 It made for a breathtaking and nourishing time. That evening was the Passion, or talent, Show. 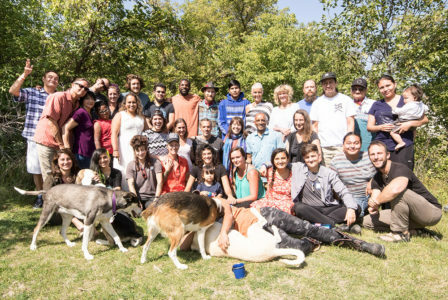 After dinner in the setting sun, Delacina met participants in the clearing at the center of the All Nations grounds on Horseback and spoke to her and the Lakota relationship to animals, dogs and horses in specific. For many people that were present, watching Delacina weave two traditions of her people–horse culture and hoop dancing–was a moving testament to the power of the ways young people can draw on their traditional ways to give birth to new cultural forms and their own unique expressions of creativity. Watching her father, Dallas, humbly and a little bit awkwardly support her added to the power of what she shared! Afterward, folks made their way back to the meeting space for the Youth MC team of Michael, Alex, and Khalil. From wholly raw and emotion filled poetry to uncontrollable laughter, many participants offered in a creative way a bit of who they are. This evening created a moment inside the larger moment of the gathering harkening back to the “Blessings and Beauty” public event held during the LA Gathering. 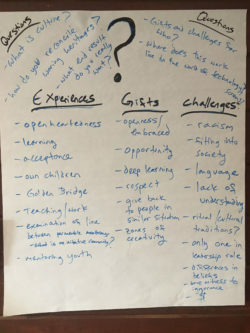 Day Four – What is Actually Needed – The Gift in Offering: The day began with movement held by Melissa Michaels. 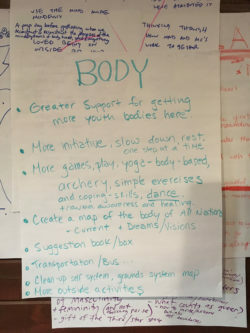 Participants began to move some of the energy and tension in our bodies from the weekend so far. 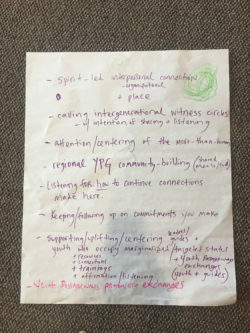 As the gathering drew toward closure, there was a common sentiment that participants needed a chance to get to know what each present had brought in terms of skills and knowledge as one of the many ways YPW would live into the idea of alliance. 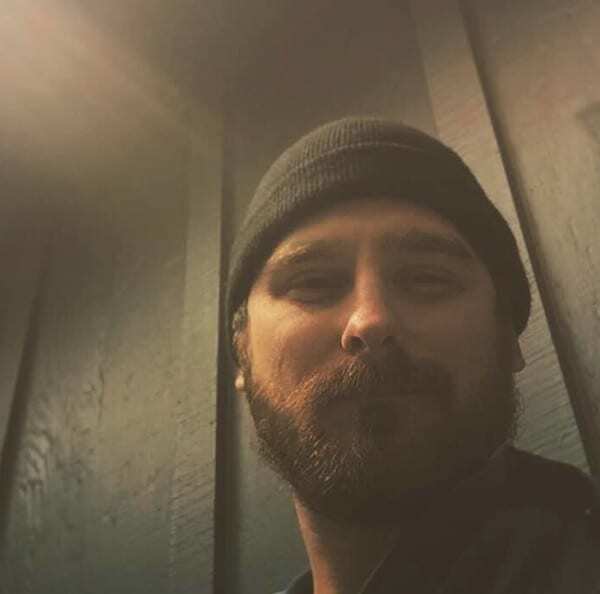 Simultaneously Dallas had started a conversation with Dane (and championed by sweet Khalil) about using their combined collection of bows to close the gathering with an arrow ceremony in which prayers were tied to arrows and shot out into the land. So as the morning session unfolded, each participant was encouraged to make a prayer tie, knowing that some folks had to leave earlier in the afternoon. As each of the adults shared, one of the participants, Angus, recorded what each offered on a large drop cloth attached to one of the walls with a promise to translate to a spreadsheet and disseminate to the collective upon their return home. A common component of the sharing was a feeling of being under-resourced overall and simultaneously in need of more of the kinds of gatherings like those that Youth Passageways hosted. After each of the adults and elders had gone, everyone transitioned outside and formed a circle around the youth to center their voices and to hear what their needs were. Many listening felt humbled and heartbroken, listening to the challenges that the young ones faced. 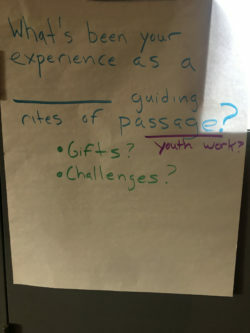 A common refrain the youth shared was a desire for more experiences like this weekend gathering. As each spoke, they lifted up the others and together began forming a protective and supportive bond, even while they offered clear and passionate appeals to the practitioners and facilitators surrounding them! As the group headed back to the central meeting space, departure time was approaching. 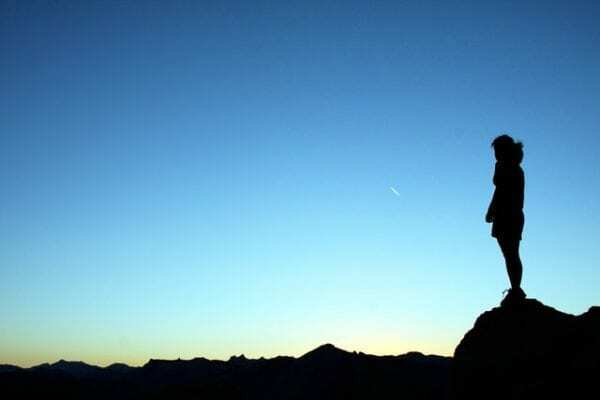 Dallas rallied a group of seven folks from Pine Ridge and YPW to take up bows, each with a bundle of the prayer ties affixed and on the count of three, they were loosed out into the bluff overlooking the land. The cheers and laughter were riotous and as the circle came together in closing, each person was invited to embrace every other in a beautiful chain of love and doksha (farewell for now in Lakota). 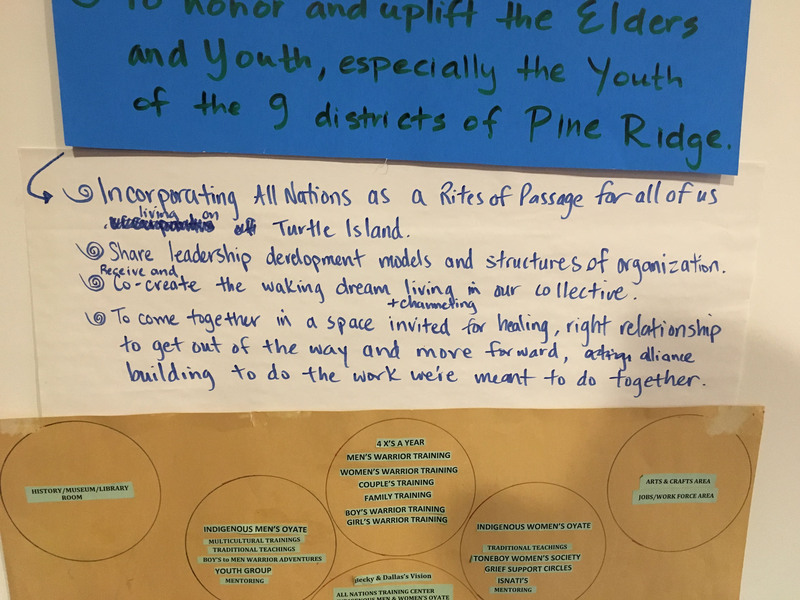 What’s Happened Since & Next Steps: Since the gathering, many things have been moving in those who attended, in the All Nations and Pine Ridge communities themselves and between them and the greater YPW community, here are just a few. 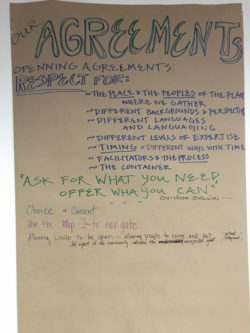 Participant Follow Up Call: Participants gathered for a call in the month after the gathering to reflect on their time and to discuss what was most impactful for them and some of the steps below. You can listen/watch the call HERE. All Nations / YPW Alliance: Dane (and other interested YPW delegates) will head back to All Nations this coming April for the next All Nations Annual Gathering to keep dreaming into the alliance as well as to continue the arrow ceremony started with Dallas this fall. Youth Council – Delacina along with youth from around the reservation have also formulated a Youth Council to meet each month at All Nations with male and female delegates from each of the 9 districts (As well as the invitation to two-spirited delegates as well) to talk about what they want to see happen in the coming months and to hold a Passion/Talent Show those same evenings! Elders Council – In September, Dallas and Chubbs began going to all the Elders in the 9 districts and inviting them to start an Elders council in response to the Youth Council with the goal of eventually having them be informed by each other! All Nations & Golden Bridge Yolanda has already made a trek out to the Front Range to continue building relationship with Golden Bridge and Becky is slated to head out in the coming weeks. 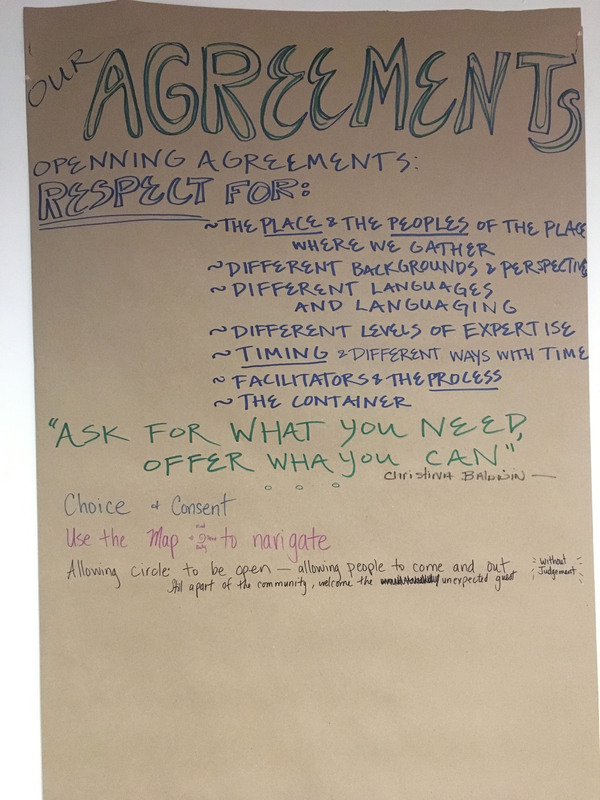 There are also plans solidifying to integrate movement programs into the All Nations program offerings in 2019 and for a joint dance center to be built at All Nations at some point in the future. The warmest of thanks to Becky and Dallas Chief Eagle who opened their home to Youth Passageways in the spirit of generosity and healing, and to the whole All Nations family including Brother Chubbs Francis Thunder Hawk, Brother Larry Swallow, Sister Yolanda Cordova-Swallow, Sister Carol Iron Rope-Herrera, Leksi’ Chris Eagle Hawk, Leksi’ Johnny Gibbons, and Leksi’ Cecil Cross. And a specific and poignant thank you to the youth who brought such vulnerability, trust, courage and grace to our time together including Delacina Chief Eagle, Alex Swallow, Michael Bull Bear, Brittany Poor Bear, Duane Two Bulls, Khalil Parekh-Richardson and to the whole His Horse is Thunder clan (Akicita, Tessie, Sol Mahpiya Zi, and Anina)! The gathering cost $26,097. Our goal for this gathering was to break even, and we did exactly that. 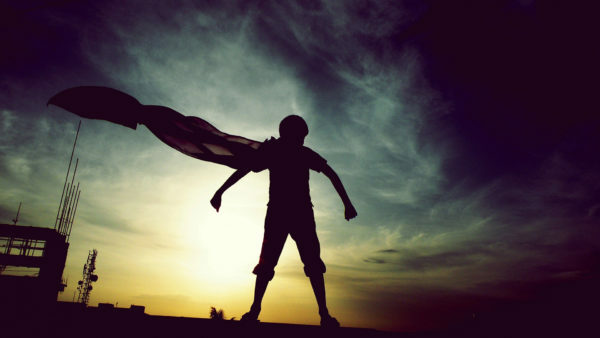 In April, we launched our Making Kin fundraising campaign and secured funding from the Kalliopeia foundation as well as a new grant from the Arbonne Foundation, combined with individual contributions that brought us to $17,600 with another $3,200 in registrations costs which gave us exactly $3 in net revenue! The success of breaking even however, should not be understated, even, for a fact, allowed us not only to bring folks from across North American to Pine Ridge but additionally, to contract with local folks for various logistical needs and to keep the resources close to Pine Ridge! Including but not limited to: Kruti Parekh, Marisa Taborga Byrne, Darcy Ottey, Sobey Wing, Ramon Parish, Melissa Michaels, Gigi Coyle, Orland Bishop, Dane Zahorsky, JO Jett Oestreich-Cazeaux, Frederick Marx, Lia Bently, Clement Wilson, Siri Gunnarson, Will Scott, and Angus Maria Moore. And a special thank you to Aidoneus Bishop who offered his hands and his amazing food alongside brother Filmore Richards in the kitchen, and to David Moskowitz who so graciously gifted us with so many beautiful images!